City of Dunedin, Florida launches a new government website in partnership with Vision Internet - the Government Website Experts. We feel we are putting our best foot forward with the launch of this well-designed website. 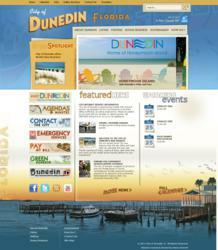 The City of Dunedin is excited to announce the launch of a new City website – now live at http://www.dunedingov.com. The rebuilt website integrates a number of new Gov 2.0 functions as well as a fresh design, intuitive navigation and a mobile platform that is compatible with all major smart phones. Vision Internet was contracted to work with the City as a web development partner. Vision Internet specializes in city, county, and special district websites. They offer a government-focused content management system that allows easy access to administrators throughout the City to update the site. The new website was built around today’s government website best practices. To ensure fair accessibility to all, the site is ADA (section 508) compliant and provides text-enlarging features to improve content visibility. With the launch of this website, the City of Dunedin has cemented their commitment to effective communication and online outreach with the citizens of the community. The City can also be found on Facebook and Twitter as well as productions of Dunedin Television that can be viewed on the City’s YouTube Channel (cityofdunedinfl). To learn more about the government-focused technology that has rebuilt online communication for the City of Dunedin, please visit http://www.visioninternet.com/visioncms.